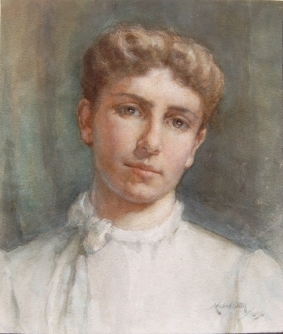 Welcome to the website devoted to the life and work of the New Zealand painter Mabel Hill (1872-1956). As regards her life, the Dictionary of New Zealand Biography provides a good summary. In addition her diaries have enabled the construction of a detailed chronology and a summary chronology of her movements from 1926-1955. As regards her works, the catalogue currently includes some 400 works (note that the catalogue page is large and will take some time to load). Generally it does not include the contents of the eleven of her sketchbooks that are known to exist, or other loose sketches. Beyond that, the works have been selected for inclusion simply on the basis that we have some kind of an image of them, not on any criterion of quality. They range from 1884 to 1951, and are arranged chronologically as far as that has been possible. Undated pictures are at the end. At the moment we do not know the ownership of many of the works included. And we believe there exist many more works that we have not seen images of. We should be most grateful for information from owners whom we do not yet know of. Please contact us. And we should also be very glad to hear from anybody who can correct or supplement the information we have for the works currently in the catalogue. Compiling the catalogue would not have been possible without the help of the owners of the works, both individuals and institutions. We would like to record our gratitude to them, and also to the many other people who have contributed to the project, in particular to Jane Vial and to Keith Harris.